No matter where you stand on the issue, most would agree U.S. immigration policy is complex, confusing and controversial. For over a century, BakerRipley’s mission has revolved around “education, industrial, social and friendly aid to all those within reach” based on the vision from our founder Alice Graham Baker. This extends to immigrants, refugees and their families in our communities. We delved into some key questions surrounding immigration with Jill Campbell, BakerRipley’s managing immigration attorney. We asked her to explain the current immigration atmosphere, the citizenship process and BakerRipley’s immigration and citizenship services. Q: People on both sides of the issue agree immigration is in need of reform. How did we get to this point? A: The United States has not comprehensively addressed immigration since the mid-1990s, and a lot has changed since then. The laws that were passed in the mid-1990s were incredibly punishing and have prevented many immigrants from obtaining lawful status in the United States. As a result, there is an undocumented population of about 10-11 million individuals across the country, and many have lived and worked in the United States for decades. These individuals make up the fabric of our communities and contribute in many ways. But they are still living in the shadows, in fear of law enforcement and immigration enforcement. 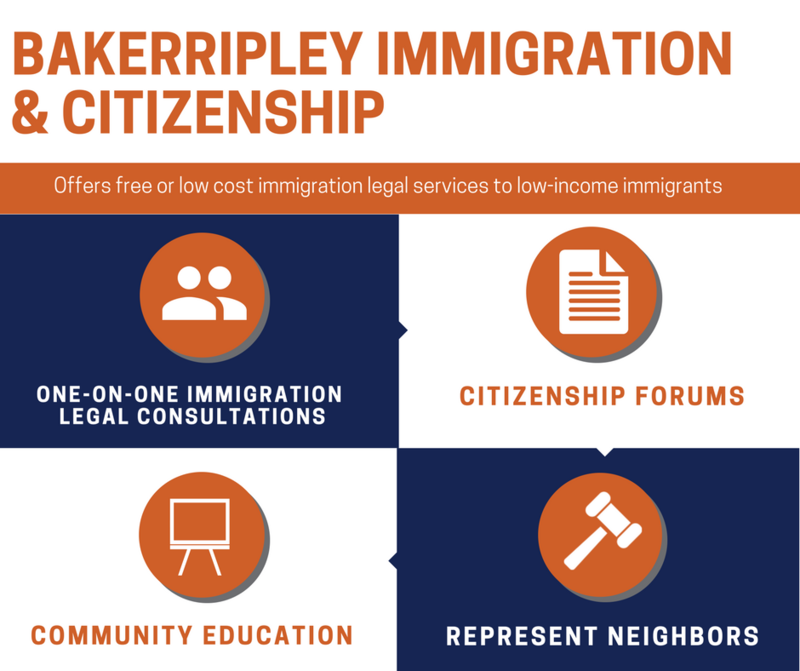 Q: What is BakerRipley’s approach to immigration? What immigration services do we offer, and why is there a need for these services? A: Our Immigration & Citizenship Program offers free or low cost immigration legal services to low-income immigrants. Unfortunately many of our neighbors cannot afford private immigration attorneys. Without low cost and free services, many would be unable to apply for immigration benefits. Our services fall into four categories. • We provide one-on-one immigration legal consultations for a variety of immigration issues or processes. • We host Citizenship Forums where we partner with the City of Houston, NALEO, and Univision to provide immigration assistance to people who want to apply for naturalization (citizenship). • We offer in-house direct services, which means that we formally represent individuals in immigration cases, both with United States Citizenship and Immigration Services (USCIS) and with the immigration courts. • We offer community education in the form of immigration orientations and Know Your Rights presentations. Q: How long does it take to become a citizen? A: If an individual is undocumented or is living in another country, he/she first must apply for a green card. That process can be very quick, for example, if you are married to a U.S. Citizen, the process can take 12-18 months. Or, if you in a visa category that requires you to “wait in a line”, the process can very, very slow – you could easily be waiting for a visa to get a green card for 15-20 years. Once you successfully obtain a green card, you need to wait for five years before applying for U.S. Citizen (three years if you received your green card through marriage to a U.S. Citizen). Right now the application process for citizenship is about 16 months. After 16 months you take an exam and have an interview. If the officer approves the case, then you wait a few weeks before taking an oath to become a U.S. Citizen! Q: What is the process that refugees face when trying to come to the United States? A: A refugee starts the process by working with the United Nations to be designated as a refugee, which is generally an individual outside his/her country of origin who fears returning to his/her country due to persecution or a fear of future persecution. Many refugees are living at United Nations camps across the globe as a temporary protection while they wait to either return to their home country or to be resettled in a third country. If a refugee applied for resettlement to a third country, it could many years before he/she is recommended for resettlement and start the process. Many of our clients lived at refugee camps for well over 10 years before starting the resettlement process. After being approved for resettlement to the United States, the refugee must then pass the interview and background check process through the United States Department of Homeland Security. For many, this background process can take another few years to be completed. After being approved by the United States, the refugee is brought to the United States and given a pathway to U.S. Citizenship. Of the several millions displaced refugees across the globe, only a small amount are allowed to be resettled in the United States. Since passage of The Refugee Act of 1980, the U.S. has historically accepted anywhere from 70,000 – 200,000 refugees per year. In the 1980s and 1990s we would regularly accept over 100,000 refugees per year. In 2016 we accepted nearly 85,000 refugees. However, the current administration is seeking to limit the number of refugees admitted per year to under 45,000. Additionally, in 2017 a temporary “refugee ban” was instituted, halting the entry of already-approved refugees from coming to the United States. Many of our clients who were waiting to be reunified with their family members were affected by this ban, including clients who had not seen their spouse and children for many years. A: People need to know that the way immigration laws are being enforced has changed over the last 18 months. Immigrants’ rights are being restricted, and their ability to access pathways to US Citizenship is being limited. The cancellation of DACA and TPS will change the fabric of our communities and will drive community members back into the shadows. We need to constantly remind ourselves that we were a country founded by immigrants and a country that has been built by immigrants. Driving people away and kicking people out is not who we are, and we need to make sure that in the face of adversity we stay true to who we are as Americans and Houstonians. Jill Campbell is BakerRipley’s managing immigration attorney. She is primarily responsible for managing the program’s client cases, which includes the supervision of the program’s BIA Accredited Representatives. Jill’s immigration work focuses on Citizenship and Naturalization; Deferred Action; representation of refugees and asylees; family reunification cases; and humanitarian-based relief. Jill also supports the Immigration & Citizenship Program’s Naturalization services through the development of materials for and ongoing legal support of BakerRipley’s Immigration Forums and Naturalization Workshops.